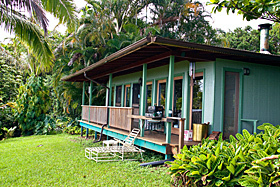 Entabeni Cottage vacation rental sits above the world famous "Road to Hana" overlooking the Pacific Ocean in the tropical rainforests of East Maui, Hawaii. Our gentle climate massages body and soul of visitors who come to enjoy our tropical paradise. Entabeni Cottage is a clean and private, fully-equipped home (860 square feet), powered by the sun and beautifully situated on a gorgeous 6.25 acre tropical flower farm known as Entabeni Gardens. Rent Entabeni Cottage during your Maui vacation and enjoy ocean views from your king or twin-size beds, fully-equipped kitchen, lanai (deck), and private yard with your own warm water outdoor shower. There's no TV or radio reception in this remote area on the north shore of Maui. However, you can make free phone calls to the USA and Canada, use our satellite Internet connection to check e-mail and enjoy a DVD player with a small entertainment library. Read about other amenities. We're located about about 90 minutes (36 miles) east of Kahului Airport and about 25 minutes (8 miles) west of Hana. The back of our property borders the EMI Water Conservation District. Trails and nearby hikes lead to waterfalls and fresh water pools on the eastern slopes of Haleakala ("House of the Sun"). Electricity from sunshine; water from rain; eggs from chickens; fruit, veggies, and flowers from the land. Our property includes Entabeni Gardens with our exquisite collection of 400 varieties of tropical and sub-tropical plants. See the EntabeniGardens.com website (link opens in a new tab or window). Holistic healing therapy, personalized to your individual needs, is available during your vacation stay. Keli Everett provides surfing lessons from beginner to advanced. See HanaSurfLessons.com for more info. Mahalo (thank you) for visiting our web site. Contact us for reservations and more information.